Fort Peck Dam was named for old Fort Peck, which was a trading post on the Missouri River built in 1867 by the firm of Durfee and Peck. The firm also operated other trading posts along the river at that time. 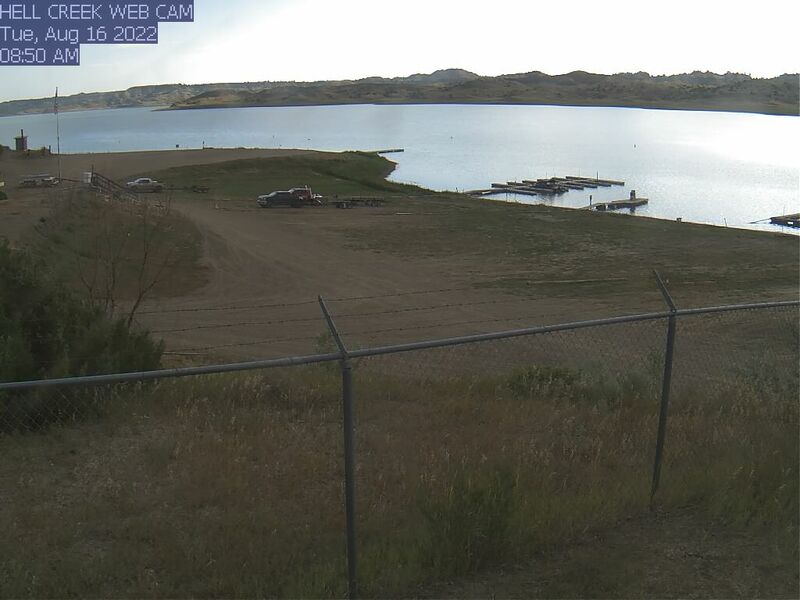 The site of the old fort is about a mile west of the current dam and is under the waters of Fort Peck Reservoir. It had been abandoned in the late 1800s and eventually crumbled into the river, long before the dam was built. Construction of Fort Peck Dam began in the Great Depression year of 1933. The federal project was completed in 1940. In between, it provided work for an estimated 10,000 people and it was estimated that 10,000 more people came in to work other businesses in the area. In all, when men, women and children were counted, some say that 35,000 people lived within a few miles of the town of Fort Peck during the time of construction. Fort Peck Reservoir, formed behind the dam, is 134 miles long, has a maximum depth of 220 feet and has 1,520 miles of shoreline — more miles of shoreline than the Pacific coast of California.. The lake is capable of storing 19 million acre-feet of water. Fort Peck Dam itself is four miles long. The width of the base of the dam is 4,900 feet. The top of the dam is 50 feet wide and is 250 feet above the base. At the time of construction, the Fort Peck project was the largest hydraulic fill earthen dam ever built. Even now, more than 60 years after the dam was completed, Fort Peck Dam is still the largest hydraulic fill dam in the United States. There are 46 different fish species that inhabit Fort Peck Reservoir, according to Montana Fish, Wildlife and Parks. Of these, FWP states 28 species are native to this stretch of the Missouri River system, including sauger and paddlefish. The other 21 species are listed as introduced species, including walleyes, smallmouth bass and northern pike. Fort Peck Reservoir claims the current world record for saugeye at 15.66 pounds, the co-world record for sauger at 8.75 pounds and the former Montana state record for walleye at 16.63 pounds and current smallmouth bass at 6.66 pounds. Fort Peck Reservoir’s fishery turned on in the late 1980s and early 1990s due to the introductions of two key bait fish species. First, spottail shiners were introduced which provided food for fish in the shallow water. Then, cisco were introduced which provided deep-water food for fish. Since then, the number and size of species like walleye, sauger, northern pike, smallmouth bass and lake trout have increased substantially. Spring walleye trapping by Montana Fish, Wildlife and Parks and dozens of volunteers takes eggs that stock walleye waters all around Montana. By far, the majority of walleyes produced go back into Fort Peck, mostly in the form of just-hatched fry. This supplements an unknown amount of natural reproduction from walleyes that run up the Missouri River above the lake. Fort Peck Reservoir is surrounded by the million-acre-plus Charles M. Russell National Wildlife Refuge. This refuge is perhaps best known now for its mule deer and elk populations. But when it was created, the target species for the mission of the refuge were pronghorn antelope and sharp-tailed grouse.